4. november kommer svenskene med sitt 10 studioalbum, smak på låt her. 'Built To Last' er tittelen, og det er Napalm Records som skal slippe albumet. En ting er sikkert, som det påpekes i starten av pressemeldingen, Hammerfall var ultraviktige for tilbakekomsten av metallen tilbake på midten av 90-tallet, så få hver og en mene det de vil om bandet generelt. Men jeg husker godt hvor fett det var og hvor bra debutskiva var, vi kan takke Hammerfall og Nuclear Blast for oppturen sjangeren fikk den gang. "The saviours of heavy metal, and one of the most influential bands for over 20 years in metal, are finally back! Hammerfall, who recently signed a worldwide deal with Napalm Records, have just left the studio and are about to release their hotly anticipated masterpiece in form of the band's upcoming 10th album, which marks their strongest work to date in their successful career and history. Sold out shows and headlining tours all over the world, Hammerfall stand for powerful, majestic and melodic heavy metal. The memorable choruses, straight and heavy riffs, thundering drums, pounding bass power and outstanding vocals have already and without a doubt became metal hymns for eternity. 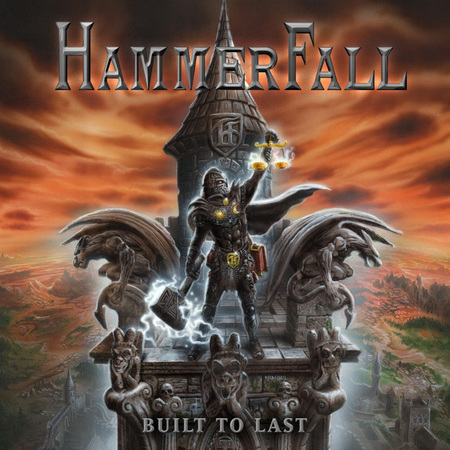 Their unstoppable creations reigned in a time when none cared about classical Heavy Metal, Hammerfall have and will always deserve credit for bringing the melodies back to metal music. 20 years later and with their upcoming studio album, Hammerfall prove that they still own the throne of heavy metal! Gitarist Oscar forteller: "Built To Last is our 10th studio album in 19 years, incredibly enough, but I think we sound more alive and vibrant than ever before! We have worked our asses off to make sure this album is a worthy successor to (r)Evolution, and I have no doubt in my mind that we have created one of the strongest records we have ever done. I am immensely proud and excited about this album, and I am confident all our Templars of Steel will agree once they hear it in November."